Problem: You have several or many documents, and you want to sort them according to the number of occurrences of a particular word or phrase (or several words/phrases). 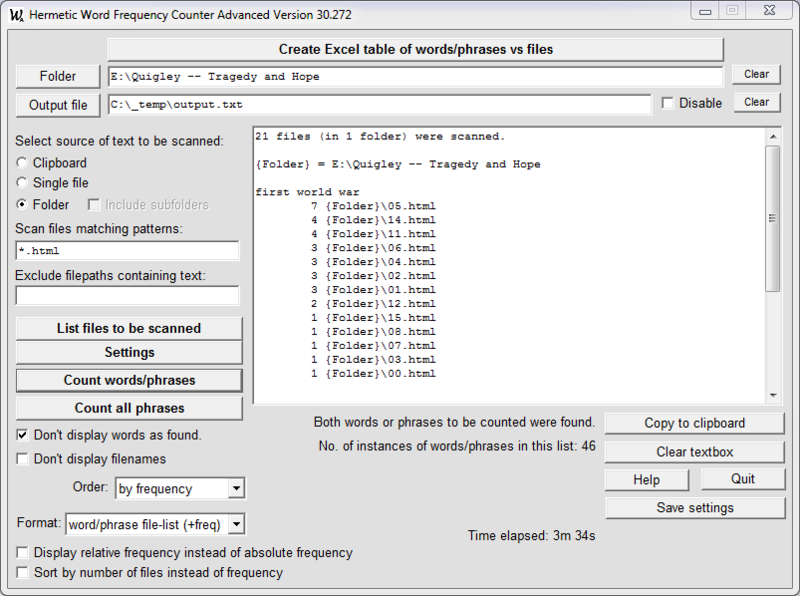 Solution: Run this program on those documents using the report format "word file-list(+freq)" and specifying the word or phrase (or several) in the "Extra count-only words/phrases" textbox in the WFCA Settings window. The result will be a list of files ordered by frequency of occurrence of that word or phrase. Sounds easy? It is. Here's an example. Which tells us that the chapter "05.html" has the most occurrences (7) of "first world war". 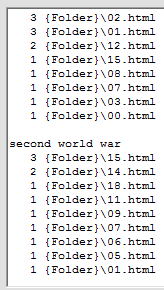 And scrolling down tells us that the chapter "15.html" has the most occurrences (3) of "second world war". We can also see which chapters do not contain these phrases.